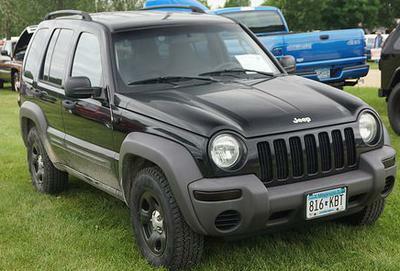 I would like to convert a 2004 Jeep Liberty Limited into electric. Complete noob here. Any advice or suggestions would help. It's max weight is 5600 lbs when loaded up with passengers and cargo. I would like to go at least 100 miles on a charge. First of all, sorry to swap out your photo, it was a technical thing I couldn't help. Hope this one is close to yours? That's one cute SUV! If you decide that this is the donor car (former gas-guzzler) you want to electrify, there are a few problems you will need to solve. In fact, to my thinking, they are big enough problems that personally I would choose a different donor vehicle. Transmission: These didn't come in a manual version; I checked. So you've got an automatic transmission to contend with, which an electric car doesn't need or want. A large chunk of your range will be lost here to transmission losses. There are a couple of ways to compensate for this, either by choosing a larger motor and eliminating the transmission altogether through direct drive; or by buying a lot more battery than you really wanted to. Weight: The cars in that era (2004) were built to guzzle gas. They've all got big butts (heavy) and are shaped like bricks (not very aerodynamic). I think the idea was to sell more gas, I don't know. The point is, you will need to move this heavy girl with batteries now instead of petrol, and you'd like 100 miles on a charge. That's not impossible, but it IS expensive. She has a 6 cylinder engine which brings the mileage down to something like 19 miles to the gallon, but let's face it: she's a bit of a gas hog. A gas hog will also be a battery hog. That's fine, you can even buy Tesla battery packs now and put them in your Dad's Oldsmobile and bring that baby back to a shine...but that costs a lot, comparatively, and is this really the car you want to do that with? 4x4: You didn't mention, but if your car is the 4x4 version instead of the RWD, more range losses. Age: If your car is a 2004, she's...how do we mention a lady's age delicately?...well, possibly body-rusty. Some important things might be wearing out. You are proposing to put a brand new (expensive!) car into a tired old body. Complexity: You are a noob, you say? You have chosen a conversion that is complexity level 10. If you want to be happy with your conversion, I wouldn't go higher than complexity level 3 on the first try. It's a challenging enough project as it is. Now that I've been a Debbie downer and rained all over your parade, I'm going to say that what you want to do is not impossible at all. More and more different kinds of cars are being converted to electric. If you really feel this is the car you want to electrify, get some help. I want to refer you to a conversion shop in Lancaster PA called BH Electrics, run by a very smart EV converter named Brandon Hollinger. He has one of the more pioneering EV conversion shops in the field, and has pushed some limits on what sort of car is the "right" sort to be a donor car (see his electric London taxi, for example). Before you spend any money, I would talk with Brandon about what you want to do and see what he has to say. Hope this helps, and best of luck on your project! The Jeep isn't a donor car. It's my actual car, and i'm using a loaner car to get around temporarily. I'll check the links out, thanks again. "Donor car" is just a term EV people use to mean "the gas guzzler that got its guts ripped out to become an electric car". No other meaning implied.